As the children and grandchildren head back to school…we can head back to the sewing room! And if you have a young one who wants to sew we have some entry machines to get them going. Stop in and see some of the great deals on machines…..starting with two machines I have for $69! Full warranty. 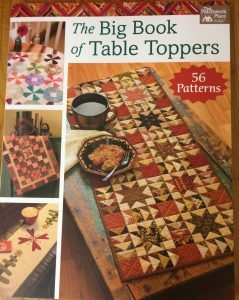 The hottest book in the market right now: The Big Book of Table Toppers. 56 table runner patterns from your favorite designers. Great time of year to sew up some quick runners before the gardens need cleaning up for the season: All levels….all styles. I have two in stock and if you purchase you’ll receive a large cutting mat that expands the entire cutting surface so you can spread out. There’s storage for your go to items and the table folds down and rolls out of the way. 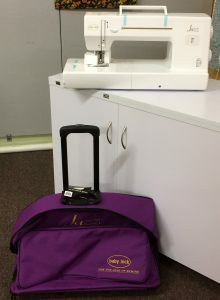 Needing a new workhorse machine to sew up some thick bags? Now is the time to take a look at the “Jazz”. All purchases through September receive a “Free” trolley. Great throat space to quilt up the runners! Your room is complete, you have new ideas and don’t forget I have fabric just in case you’re running short. Enjoy your week and swing in when you’re out and about.